"Protecting business and property with FireSafe insurer approved systems" The double tongue and groove edge alignment ensures a precise interlocking of the panels and dimensional accuracy. This positively eliminates the risk of thermal bridging and provides an air-tight between panels after erection. 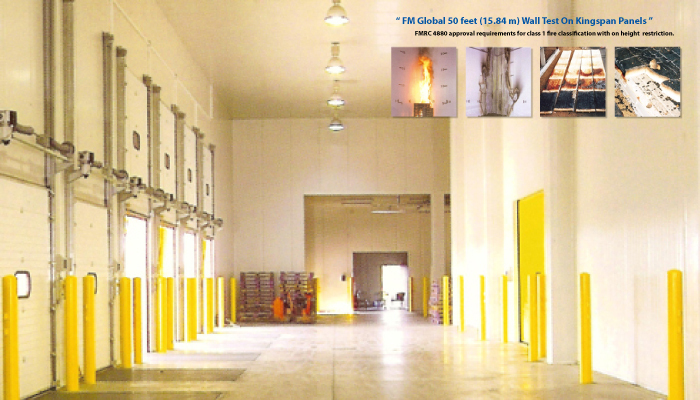 FM Global (FM), formally known as Factory Mutual, has a severe test standard for assessing reaction to fine, This test standard is FMRC 4880 (1994) Approval requirements for Class 1 fire classification. in both surface iron sheets of the panels. PVDF : For inside and outside use where there is a high risk of corrosion. Plastisol : High elasticity and very good corrosion-prevention properties; suitable especially for internal use. Kingspan lzopoli cold store panels, facings are long lasting, easy to care and provide hygienic and low cost solutions.